· Heat oil in a saucepan over medium high heat. Add onion. Cook for 3 minutes or until soft. 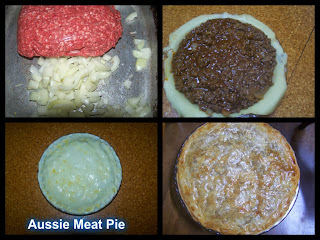 Add mince. Cook for 4 minutes, stirring with a wooden spoon, or until browned. · Place a sheet of shortcrust pastry into the pie dish. Fill with mince. brush rims with water. Place a sheet of puff pastry over meat. Press to seal. Trim. Brush with egg.